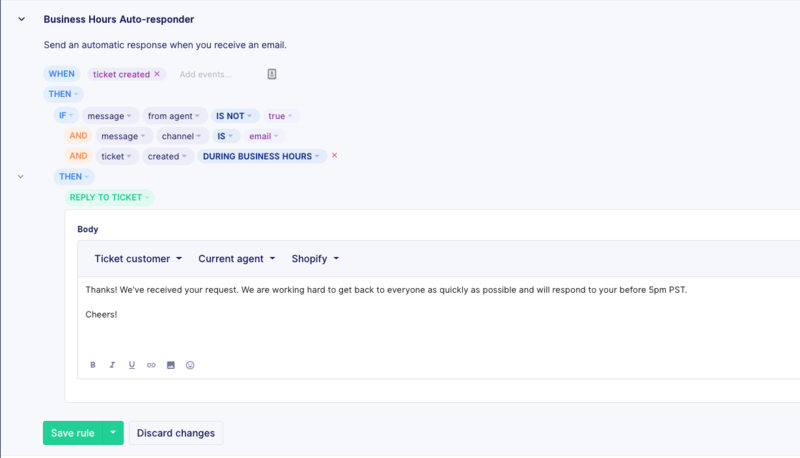 The "Business hours" setting allows you to set the days and times in which you have support representatives available. You can access this setting by clicking on "Settings", then in the left side navigation bar click on "Business hours". You can select different time periods for each day or you can use one of the groups for "Weekdays", "Weekend", or "Everyday". Once you have set your business hours you can now use that criteria in your rules. For example, you could have one auto responder for during business hours and one for outside of business hours. Take a look at the images below for examples of each.